Colombian riot police have killed a protester in the ongoing ‘Minga’ rural strike which has shut down large parts of the country’s southern regions and since spread elsewhere. 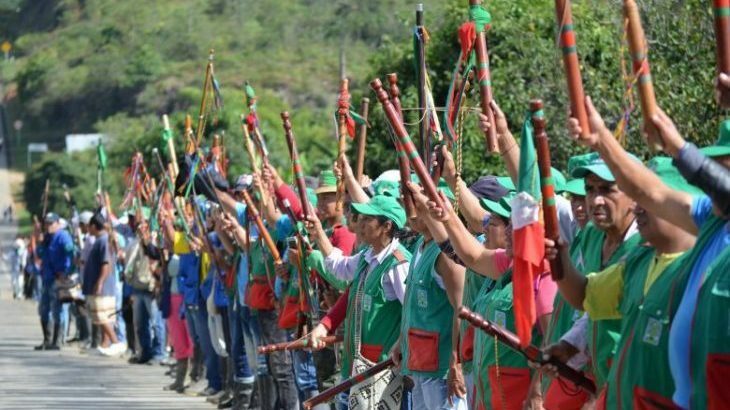 Since 10 March, indigenous and rural communities have been demanding the state fulfil agreements arising from previous disputes in the region, particularly in the department of Cauca where the Minga began and where it has been most intense. The killing took place on Tuesday 2 April in the El Cairo municipality in Valle del Cauca, after ESMAD riot police attacked protestors. One person, named as José Breiner Yunda Camayo, was shot dead. Strike leaders and opposition politicians have accused security forces of brutality following multiple injuries sustained by protesters, including children, women and the elderly. As well as increased investment in regions heavily impacted by chronic poverty, underdevelopment and instability, Minga demands include full implementation of the 2016 peace agreement and emergency measures to protect social leaders, following the murders of more than 500 people for political, social or community activism since 2016. So far, there has been little dialogue between the government of President Iván Duque and strike leaders. Duque has refused to meet with Minga protesters to discuss a resolution to the disptute, while talks with other ministers have been stalling at best. The term Minga is an indigenous term referring to communal labour which benefits the community. There have been several such strikes in recent years.